Happy Valentine's Day! Valentine's Day is meant to be a day to show your love for those you care about. Pets can definitely be included in this celebration! Of course, we always show our love for pets year round. But we did have a little bit of extra fun with Valentine's Day this weekend. We got a few items from the Martha Stewart Pets Valentines line of pet products. Martha Stewart Pets makes some of the most adorable pet products including toys, clothes, bedding, collars, and more. As an extra special treat for Valentine's Day, stop by PetSmart and pick something up for your dog or cat. 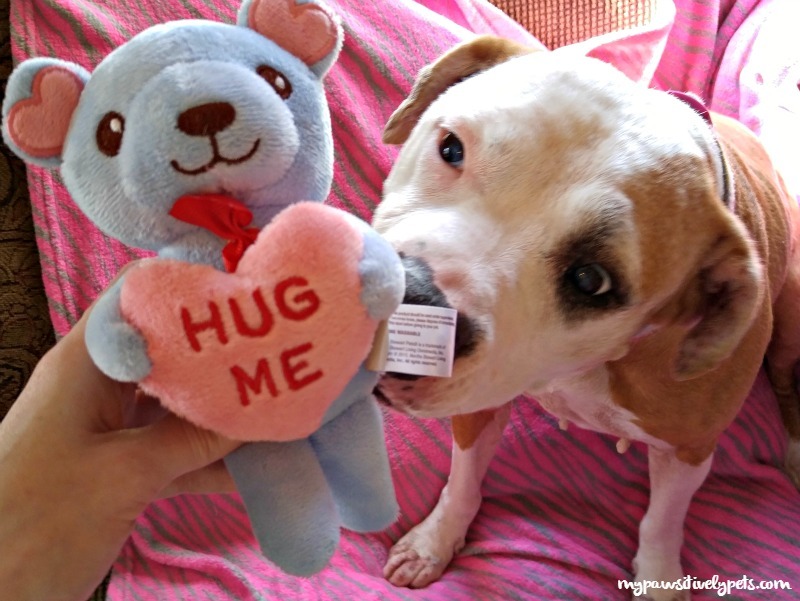 Shiner got several new Valentines toys from Martha Stewart Pets. I love these toys, but sometimes I think they are too cute to let the dog play with! Shiner always loves their toys and the rope toys always seem to hold up well with her. 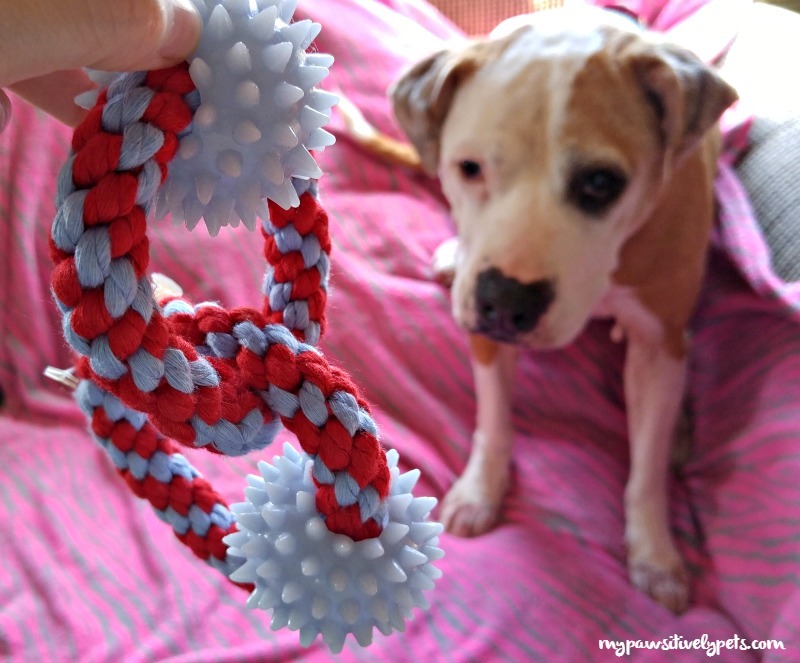 This rope toy is a little small for Shiner, but is the perfect size for smaller dogs or teething puppies. Shiner also got a very cute plush toy that says "HUG ME". Again, another small toy but Shiner loves her stuffies. It's so cute! She was very excited to get her paws on this toy. 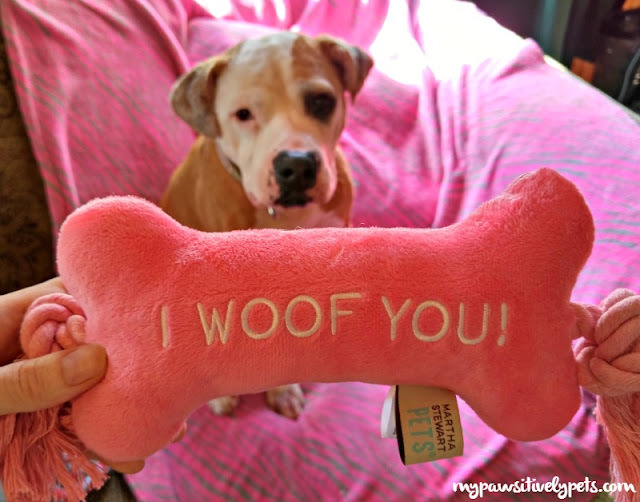 And last but not least, Shiner got a "I WOOF YOU" bone. This one is a great size for Shiner and I think it is her favorite out of all of the toys she got. It's soft and squeaky and has some rope attached to the ends. We also got some dog shirts from Martha Stewart Pets, however they are too small for Shiner. As I was looking at the shirts, I thought they just might fit the cat... much to Callie's dismay, they do fit her perfectly! And they are adorable. These shirts are a size Medium. Callie wore her Cutie Pie dress for a little while, but I don't think wearing clothes is really her thing. She was a good sport about it, but didn't really feel like posing for the camera too much. Yes, I'm a cutie pie and I know it! 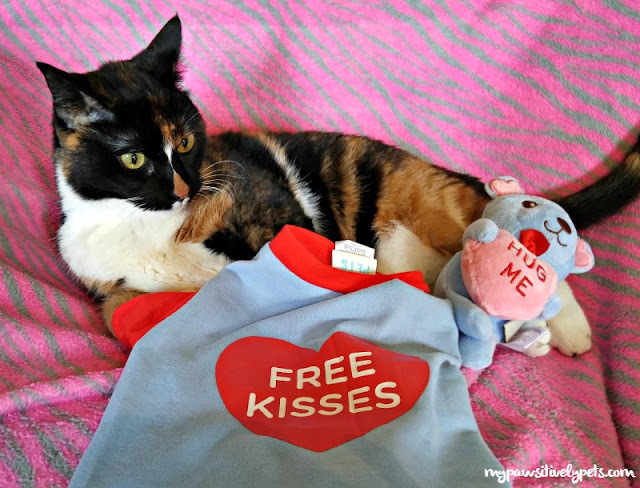 We also have a "FREE KISSES" shirt from the Martha Stewart Pets Valentines Line, but Callie was only interested in modeling one thing. No free kisses from this kitty! If this said "FREE BITES", I would totally wear it. So as you can see, Martha Stewart Pets has tons of adorable Valentines Day stuff for pets. You can find Martha Stewart Pets products exclusively at PetSmart in stores or online. While Jack and Gus did not get any cool Martha Stewart Pets stuff, I did take their photos for Valentine's Day too. Can't leave them out of the fun! After making some new friends, the boys enjoyed a tasty treat of some granola bar. And we hope you get some tasty treats for Valentine's Day too! Have a lovely day! All Martha Stewart Pets products featured in this post were provided to us free of charge. Have a wonderful weekend and a Happy Valentines Day! You all look great, but Callie has stolen the show- so beautiful! Happy Valentine's Day! 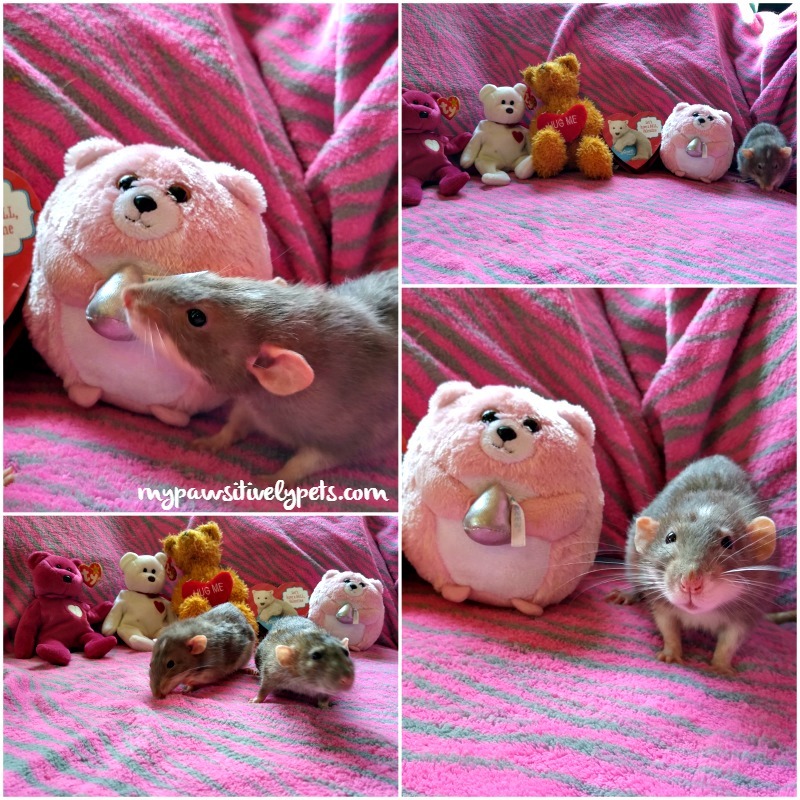 It looks like the rats enjoy the photos more than Callie! Awww, you are all so sweet! Happy Valentine's Day to you, dear friends! Happy Valentine's Day, Ann! :-) Love those pics of Jack and Gus!! We like Callie in her cutie-pie dress. Happy Valentine's Day to you all! She hugged the Hug Me doll real well though! 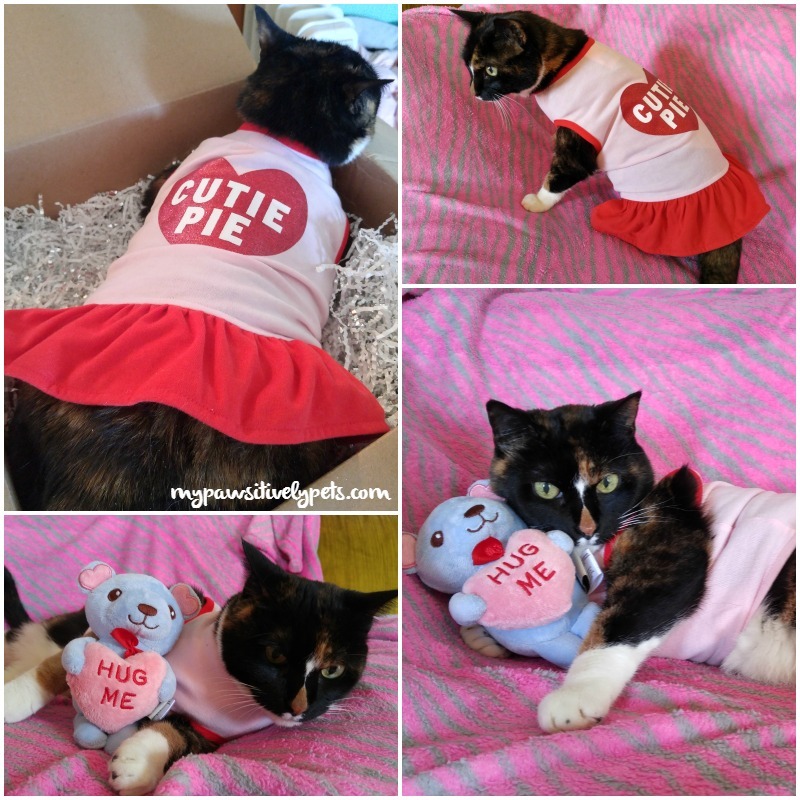 MOL - keep those shirts AWAY from us! Happy Valentines to all our friendly furry friends at Pawsitively Pets! What a fun Valentine's Day you had! We didn't do anything special this year; things have been kind of crazy around here...but we'll make up for it soon!